stock here, keep in mind, this article was done in 2015 for 2014 data. In 6 years, going on 7 years, the results of Fukushima are showing up. That’s more than 10 percent up from 2013, and a significant increase from $75 billion five years ago, announced a report published Tuesday by the IMS Institute for Healthcare Informatics. 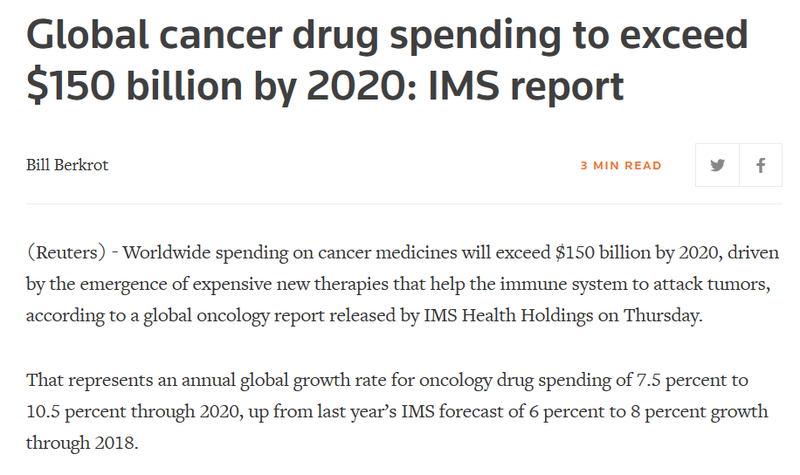 Targeted treatments, which target specific drivers of cancer, now claim almost half of total spending, IMS announced. 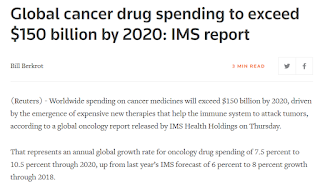 IMS, which provides prescription drug use data for the pharmaceutical industry, said it found 586 cancer treatments from 511 companies were in mid- to late-stage development. Thyroid cancer from low doses of radiation takes 10s of years to manifest. This is media and junk medicine run amok for an agenda. You shouldn't conclude causality without the facts presented. I believe you are just repeating the party line. BOOM Fukushima! Then 555 times the thyroid cancer rate. A clear visioned person doesn't need more proof. Yeap, the doctors who really care are being dropped liked flies.